Peak Positioning Technologies (PKK.C) (PKKFF) released Q1 results. They were nothing to write home about with $7.3 million in revenue and a net loss of $661K. However, the company had already prepared us for a weak Q1 as it is in the midst of another pivot into the much more lucrative lending opportunity. This has delayed transactions on the Gold River platform that require lending which caused revenue and margin to fall far short of original expectations. While the company will be challenged to meet previous EBITDA and revenue targets, I remain bullish with my $0.50 target as I like the direction the business is headed. PKK management is trying to be as transparent as possible while some shareholders are still a little confused. I believe we will get clarity soon enough as PKK has promised an updated presentation on ASFC which should be coming in the next few days and advances on the ASFC business by the end of June. Margins are expected to increase drastically once the lending business is live. While the raw materials transactions are expected to earn margins of 0.5% to 2%, the interest revenue expected by financing these transactions range from 9% to 24%. 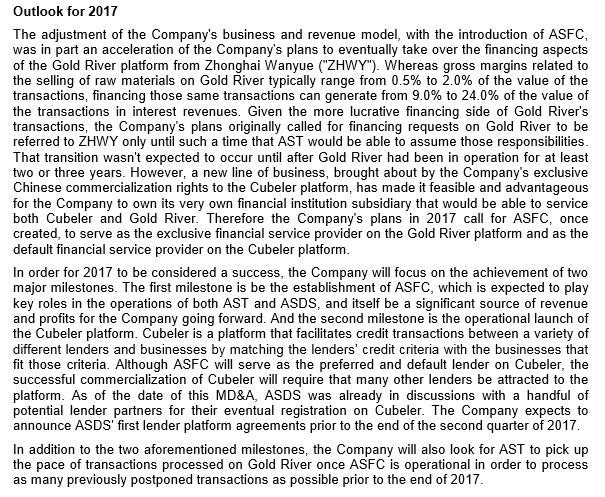 Two major milestones need to be achieved in 2017 - the launch of ASFC and Cubeler. Cubeler will be a service available to lenders outside of ASFC. ASDS has been in discussion with potential lending partners. Peak expects to announce ASDS' first lender platform agreements by the end of June. This leaves open for the potential of a "name drop" that could move the stock price. Although it is just as likely that any deals signed will be with an obscure Chinese firm that will be very important for business development but won't be the source of a news release fueled pop. PKK remains consistent with a lot of promises made in a short time frame. I remain cautiously optimistic that the company will adhere to these timelines and that we will hear a lot of about ASFC over the summer.